Fontainhas - A Whiff of Portugal in Goa! I remember leafing trough a travel magazine once, looking admiringly at the photograph of a colorful town somewhere in the Portuguese region. Little did I know then that something as pretty as that picture was right here in Goa! Fontainhas - the Latin quarters of Goa is replete with vibrant picturesque homes and cafes of a bygone era. Amidst the fancy fine dining restaurants and chic designer boutiques of Panjim, I had no idea there was still a place like this - quiet, peaceful, and boasting of an old world charm. So I was pleasantly surprised when I stumbled onto this gem, sitting bang in the center of Panjim, yet secluded from the buzz of urban life. As we walked around, it felt like I had just crossed a little bridge connecting the past and the present. Everywhere, I could find neat little buildings with beautiful arched windows and balconies lined with flower pots overlooking the narrow alleyways beneath. The name 'Fontainhas' supposedly came due to the presence of a natural spring or fountain in the area, way back in the 17th century that provided the residents with drinking water. When I visited the place, I realised that change was not a frequent visitor here. Though some houses are still occupied by their owners, some have been converted to restaurants, heritage home stays and art galleries. But the old world charm still clings to the place! Also, another unique feature here is that you will notice that all the buildings here seem to sport a fresh coat of paint all the time. This tradition goes back to the Portuguese era when the government apparently ordered that all houses and buildings should always look freshly painted! Another note worthy structure here is the majestic St. Sebastian church that sits huddled with some beautiful old villas. Built in 1880 by the Portuguese, the chapel presently houses a crucifix which is believed to be very holy and miraculous as well. We could not take a peek inside since the church was closed at the time. Though a leisurely stroll is enough to give you a peek into the quaint charm this place exudes, you can also join the heritage walks organised by the Goa heritage action group for a guided tour. We just went strolling around by ourselves so as to explore the area at our own pace. Like I mentioned, some of the old houses and mansions have been converted into plush eateries and restaurants but some old ones remain too; and the most popular one here is the 31 January bakery that has been baking its breads and treats for the last 70 years or so. The place is a bit hard to locate as it is not on the main road but just ask any passersby and they will happily guide you to it. Nothing fancy about this place, a tiny old bakery with glass shelves and jars of local, baked goodies but they taste absolutely yumm! However, the bakery has a rustic old world charm to it that is impossible to miss. The beautiful little tables arranged outside adorned with the famous azulejos (hand painted goan tiles) enhance the beauty of the place. We bought some cakes and were certainly not disappointed. Do try their plum cake or date walnut cakes! 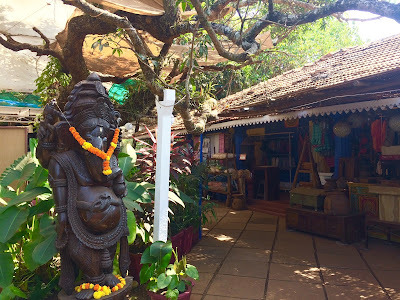 Since Fontainhas is in the centre of Panjim, accommodations are not a problem for any budget. However, if you prefer a portuguese style accommodation, there are several home stays and if you would like to go for something fancier, try the La maison or Casa Fontainhas, or the 130 plus year old heritage hotel 'Panjim Inn'. Whether you choose to stay here or just decide to explore the area on foot, it'll make you come back again. For me, it was the sense of peace and lack of the usual city-noise; and yes, for a while, I could pretend I was in some distant Portuguese town! Do you love knowing about the cultural aspects of the places you visit? Have you come across any other interesting trivia about Fontainhas? If so, please share them here; we would love to know more!